Biscotti - twice baked Italian cookies, to get that extra crunch so that biscotti become hard enough to be dipped into coffee, milk or sweet wine & not crumble. But they should never be so hard to crack a tooth. It was on my "to do list" from a long time or I should say it was on His list for me to do. Past sunday for Father's day brunch I decided to surprise him with home made biscotti along with fresh home made pizza(DD's request). Place a rack in the center of the oven, preheat to 350 degree F. Line a baking sheet with parchment paper & set aside. Place all the ingredients in a mixing bowl & blend on low speed for 3-4 minutes. Dough should come together into a ball. Transfer it to the prepared baking sheet. With lightly floured hands, shape the dough into a rectangle about 14 inches long by 4 inches wide by 1/2 inch thick. Mound the dough so it is slightly higher in the center. Bake the biscotti rectangle for around 30-35 minutes, do the toothpick test(like u do it for cakes). Remove the baking sheet from the oven & let the biscotti cool for 10 minutes. Leave the oven on. Using a sharp serrated knife slice the rectangle on the diagonal into 1 inch-thick slices. You should get 14 slices. Carefully turn these slices onto their sides, on the same baking sheet. Return the baking sheet to the oven. Bake for another 10 minutes. Turn the oven off, and let the biscotti remain in the oven until they are crisp, 30 to 40 min. more. 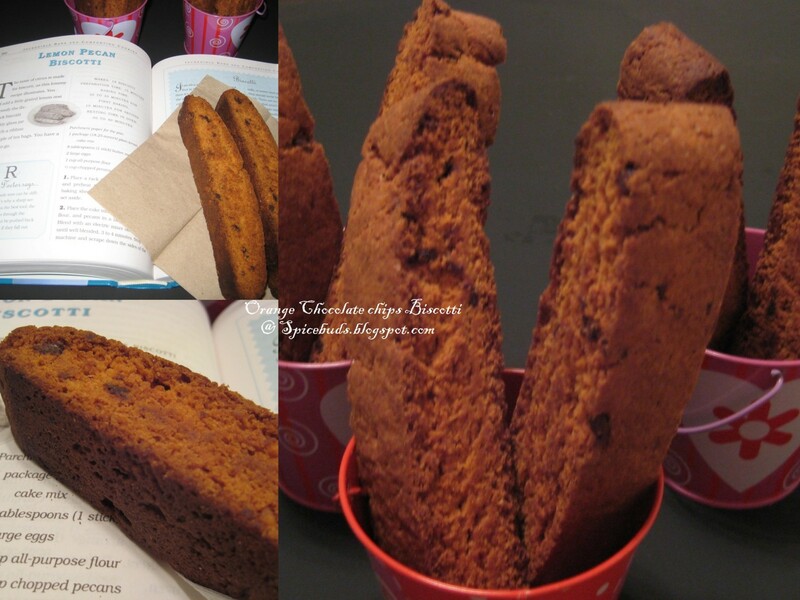 Remove the baking sheet from the oven, transfer the biscotti to a rack, and allow them to cool completely,. Enjoy it with your fav. drink milk, tea or coffee & store leftover biscotti in an air tight container at room temp. for up to several weeks. Notes : though I had baked them for the minimum specified time, still mine were little overdone, but still tasted good. I did checked them little before the mentioned time but they were not done at that time so I guess for next time I'll reduce the temp. from 350 degree to may be 340 degree. so that they don't get too brown from outside so quickly. I'm happy that I tried these, not only because everybody loved it but also because it tasted quite similar to our very own Indian cake rusk, a very popular tea snack in Delhi. We love those & I usually get those from Indian grocery store, please don't get confused with plain rusk here, as plain rusk are not sweet & they are kind of a hard toast but cake rusk are buttery & very much similar to biscotti. Now I feel no need to buy those as this was really a easy procedure & I'm surely gonna make it on a regular basis but with different flavors. Biscotti is off to Champa for her weekly Bake-off & also to Suma of Veggie Platter, who's hosting this month's Baking from the book event started by Champa. biscottis are my hubbys fav too..adding banana to the dough sounds interesting..that looks perfect..
Lovely looking biscottis. Whenever you add any nuts into your product, try flax seed meal as egg replacer. They work the best. Also, I have baked many biscottis even though I have not blogged about them. After slicing, it is best to bake them at 325 to get nice crunchy ones without over baking it. Thanks for the entry and I am so glad you used the book. Looks perfect , love orange flavour.. Thanks for sending over yummy & crunchy biscottis. looks heavenly..baked so perfectly..i make my biscottis with just nuts or dry fruits.love addition of fresh banana..wil post my version soon..
Biscottis Looks yummy, delicious , wonderful and mouthwatering. Loved the addition nuts in it. The whole blog scene is full of yummy biscotti...ur's is also like one of those...different in its own n scrumptious. I've been wanting to make biscotti for a long time; now you inspire me. i love the crunchy of biscottis! Orange flavoured, they look delicious! Thankyou for the visit to my place; I bought the kulfi pots when i was in India. Lovely! your biscottis have turned out so perfect! @ Bangalore Baker, thanks for the suggestion, I do use flaxseed in my cooking but somehow don't like to use it for egg replacement. As for biscotti I'm sure u r pro in making those, well for me I tried it for the first time & learned that I need to keep the temp. little low, but thanks for all your suggestions. @ Sanyukta, will love to see your version. @ Vrinda, do try it. @ Sage, so nice to see u, otherday only I was thinking about u & here u left the comment. thanks for stopping by.